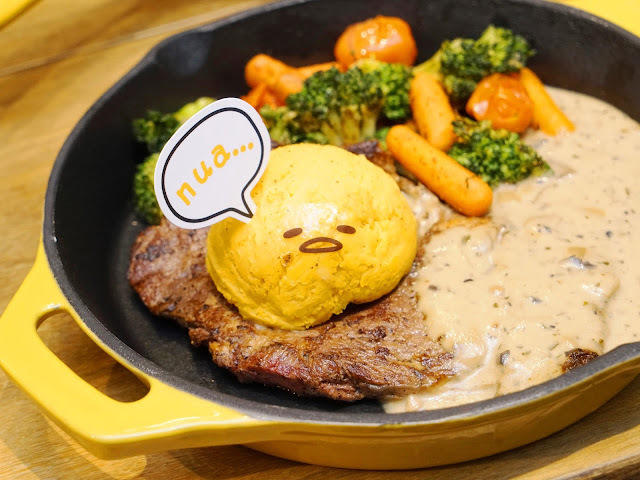 PinkyPiggu: Gudetama Café Singapore @ Suntec City Mall ~ The Famous Lazy Egg Character Is Finally Here! So Egg-citing!!! 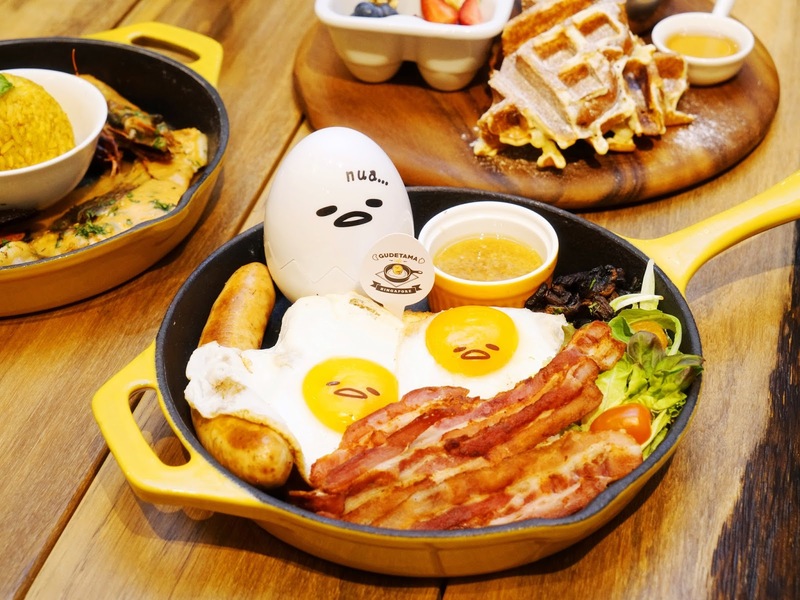 Gudetama Café Singapore @ Suntec City Mall ~ The Famous Lazy Egg Character Is Finally Here! So Egg-citing!!! ぐでたま!!! Gudetama Café opens today (30th November 2016) at Singapore's Suntec City Mall! Finally! Who's egg-cited over this egg-tremely adorable lazy egg character from Sanrio Japan too? Thanks to Gudetama, eggs are not only delicious and nutritious, it is also cute. I'm unabashed to say that yours truly IG @PinkyPiggu is a huge fan, and even made a comical effort to specially dress in Gudetama's signature yellow and white color when visiting the character themed café haha. The café is easy to spot, being located right next to the drop-off point near the convention centre wing. And of course, there is the Gudetama song which greets you as you approach the entrance. Be prepared to brace the song on repeat mode while waiting in queue. Consisting of a main dining area and an indoor garden, the café sits up to 112 people. We totally love the interior! The theme is that of a "food playground" with sunny-side-up tables, eggshell chairs and cozy egg-shaped booths. Even the ceiling is made to resemble waffles. Photo opportunities are aplenty with Gudetama figurines and also a Gudetama water fountain. Everywhere we turned, Gudetama is there looking at us with its famous apathetic expression. So cute!!! Looking at the cheery decor of the café, who would have guess that Gudetama itself is not your conventional bright and full of sunshine Sanrio character? Literally translated as "lazy egg" in English, Gudetama mostly adopts a negative "why bother" attitude because it believe that the reason for its existence is to be eaten in the end. The egg is listless, depressed and unmotivated. It is often seen relaxing in its eggshell or curling up in a bacon blanket with no desire to do anything. Don't we all resonate with these to some extent? Maybe therein lies the appeal. For a localized touch, Singapore's Gudetama has a mint leaf which it can use to shield itself from the sun or fan itself when our perpetually hot weather gets too passionate. Isn't that the slangs which we uses so often? So delighted to see these familiar terms being incorporated into the concept. It certainly made Singapore's Gudetama a notch more endearing in a way. We took quite a while to get over the initial egg-citement before settling down to another important aspect of the café..... the food. 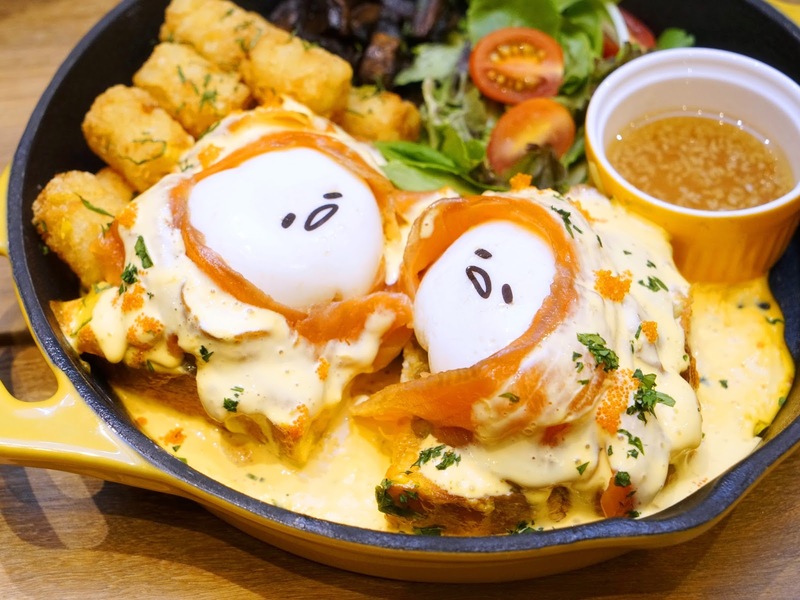 Gudetama Café Singapore is a joint venture between two homegrown food brands, Joe & Dough and The Soup Spoon. With local bento-artist Shirley Wong, or widely known as "Little Miss Bento" roped in to co-create the menu and style the dishes, the offerings are expectantly pleasing and photogenic. Inspired by popular scenes in Gudetama's animation series, the menu consist of 10 main courses, 4 side dishes, 5 desserts, 2 kids meals and a range of specialty drinks such as Straw-very Lazy, strawberry-infused rose tea with lychees and blueberries ($8.50) and Hula Hula, mango-infused rose tea with strawberries ($8.50). Prices for main courses range from $18 to $38, while side dishes start from $12.50. Here's a look at some of the items you can expect. "Call me rock". Gudetama coated with minced ginger chicken on deep-fried noodle nest, paired with creamy sesame dressing. Gudetama snug and toasty with smoked salmon as blankets! Drizzled with zesty hollandaise sauce and complete with mashed avocado, ebiko and tater tots. Bacon, spicy pork bratwurst, sauteed mushrooms, baked beans and Gudetama on buttery brioche toast. Luscious lobster bisque in a crusty bread bowl with a poached egg. 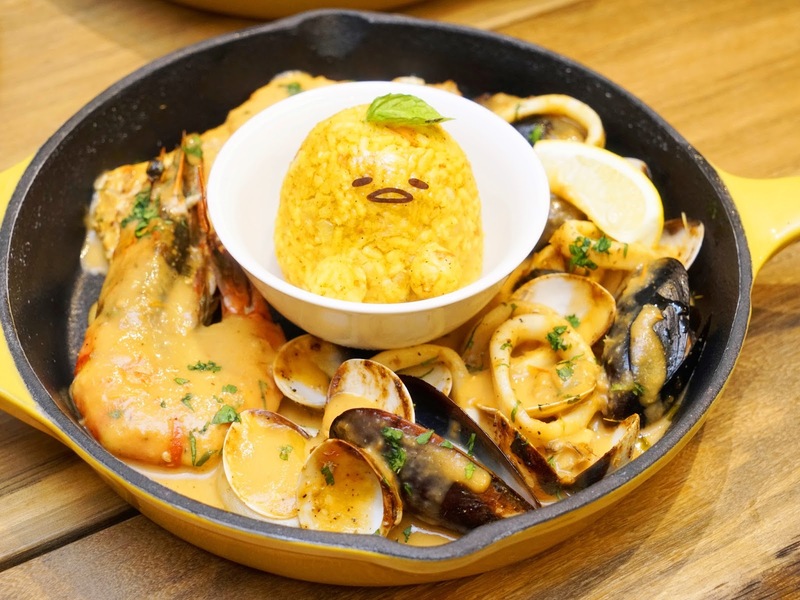 Assorted grilled seafood with Gudetama-shaped Brazilian rice. Chargrilled NZ grass-fed Angus Ribeye Steak topped with creamy wild mushroom sauce, grilled vegetables and Gudetama potato mash. 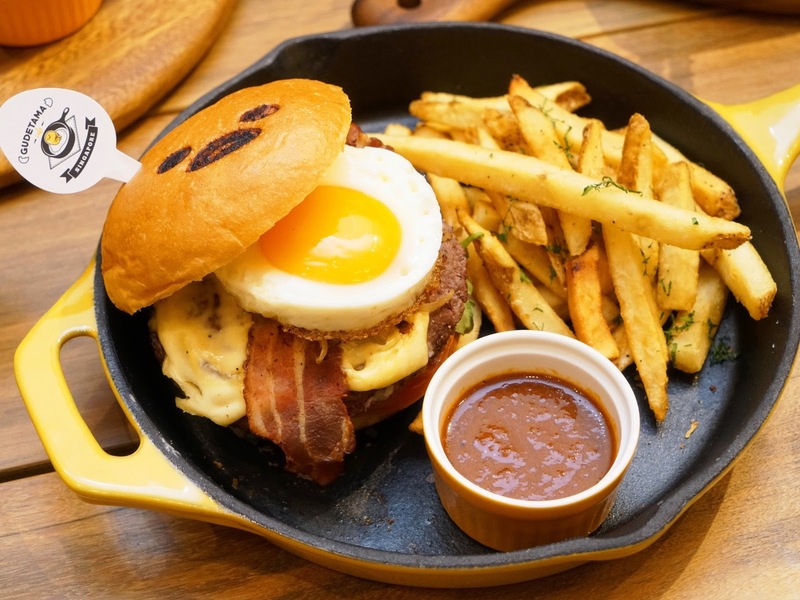 Toasted brioche bun with double prime beef patties, melted cheese, bacon and a sunny-side-up. Slow-cooked St. Louis-style pork ribs topped with smoky BBQ sauce, served with chunky fries, grilled corn and garden vegetables. Grilled Cajun chicken and sunny-side-up on buttermilk waffle, served with whipped cream and maple syrup. Shoestring fries sprinkled with parmesan cheese and truffle oil, served with garlic aioli and sriracha dip. 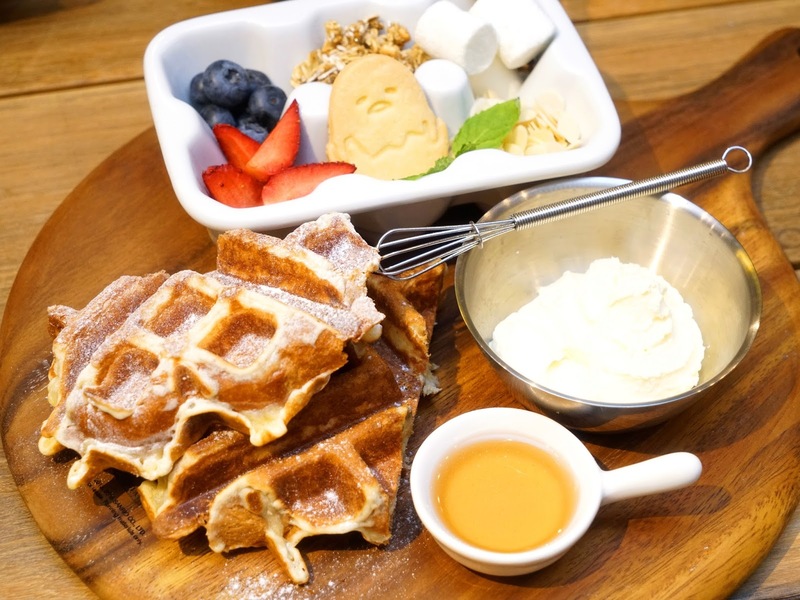 Design your own waffles with a platter of toppings and a Gudetama cookie. We did not try everything on the menu, but the few dishes that we tasted were comparatively better than the other Sanrio theme café, Pompompurin. The chargrilled ribeye was done to our requested medium-rare doneness, yielding moist tenderness at each bite. Though the mushroom sauce overwhelmed the steak's flavor, it was nevertheless enjoyable. Lobster bisque was thick and robust with a distinct crustacean flavor which instantly reminded us of Soup Spoon (but of course!). Portion-wise, it also felt more substantial than Hello Kitty Orchid Garden Singapore Café. For instance, the slab of pork ribs was cut generously. It can be rather filling with those sides of chunky fries. Read: Pompompurin Café Singapore Opens At Orchard Central ~ Cuteness Overload! Read: Hello Kitty Orchid Garden Singapore Café Lands At Changi Airport Terminal 3! It Opens 24/7! Chocolate andn feuilletine cake topped with layers of chestnut mont blanc and earl grey jelly. Served with a side of panna cotta and sweetened rose tea. Sushi cake made with egg sponge and cheesecake coated with rice puffs, served with matcha "wasabi" curd and maple syrup. Caramel flan with premium vanilla soft serve, caramelized bananas, apple crumble and a crisp sesame orange tuile. Those desserts masquerading as savory food were a pleasant surprise. Ramen? Sushi? It looked so real at initial glances that we were momentarily deceived lol. Our unanimous vote for favorite sweet of the evening went to the caramel pudding. Soft, wobbly, and not too cloying. The combination with other ingredients ensured it has a good interplay of textures. Certainly engaging as a whole. Confectionery are also available for both dine-in and takeways. Selection includes White Chocolate Mango Roll ($8.90), Baked Cheese Cake ($7.50), Peanut Butter Chocolate Cake ($8.50), and Strawberry Yoghurt Egg Shell ($8.90). We find the cakes mostly a tad dry so this is an area that has room for improvement. I personally like the Citrus Pan ($7.50) lemon tart best for its zesty kick and thin chocolate shell. 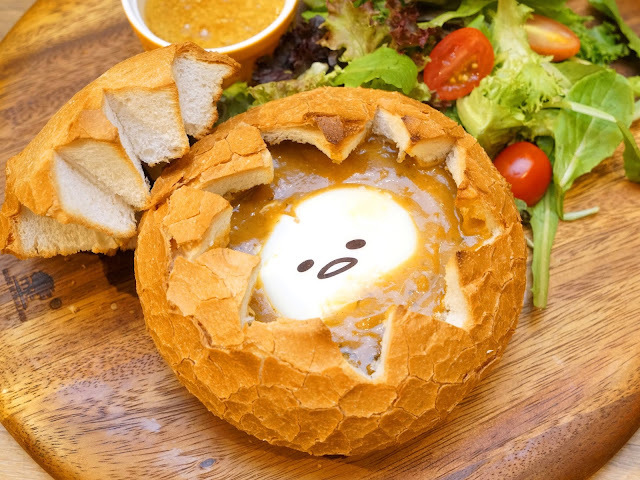 Gudetama is my favorite Sanrio character and to see it come to life in café form is a dream come true. Just as Gudetama's attitude is flawed, the café isn't perfect in all senses, but it has that unexplainable charm and drawing power. I want to go back and experience it again! If you are a supporter too, then "nua" no more. Quickly "chiong" ahhh!!! Pretty good post.Thanks for sharing. 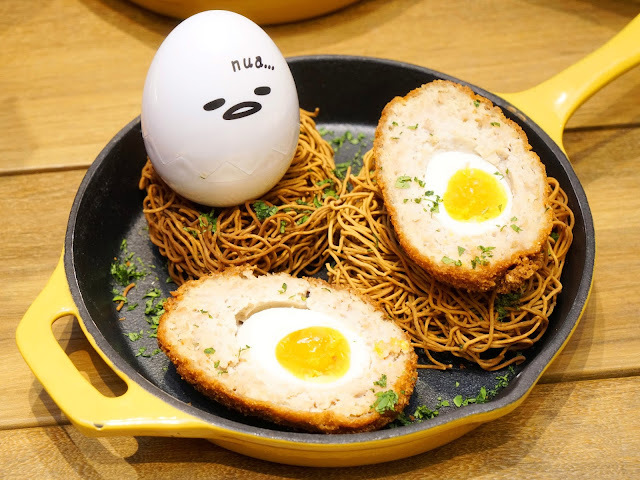 I am very glad to read your post and want to try this.Your post contains famous lazy egg character details.Yes, eggs are not only delicious and nutritious, it is also cute.Thanks for sharing this good post. Online custom essay writing services are very useful for many students that we know,but selecting a good service is very difficult.So its good to read reviews about all the services, then only you should choose the service that best for you.